SOFIA, Bulgaria (BulgarianMilitary.com) – On November 21, at an organized meeting, Lockheed Martin again made a presentation of the proposed to the Bulgarian government F-16 aircraft, learned BulgarianMilitary.com. 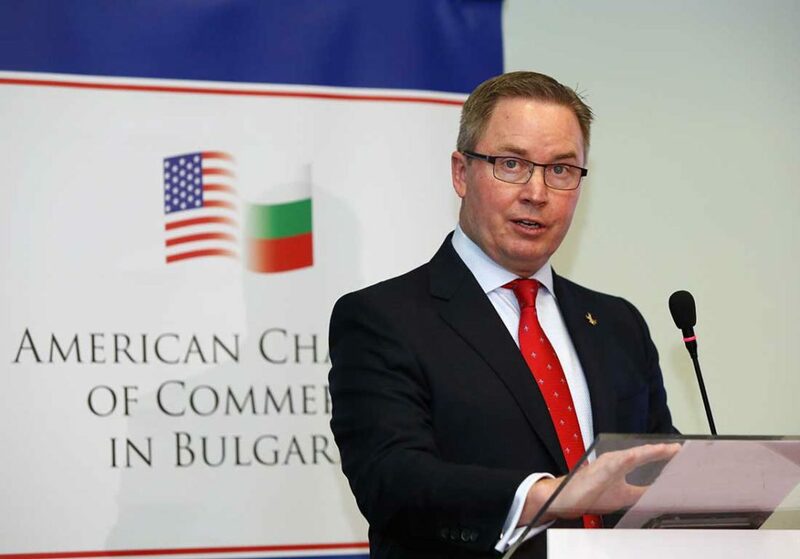 The meeting was organized by the American Chamber of Commerce in Bulgaria and short presentations to the media and part of the Bulgarian military manufacturers were made by the Executive Director of the American Chamber of Commerce Petar Ivanov, the U.S. 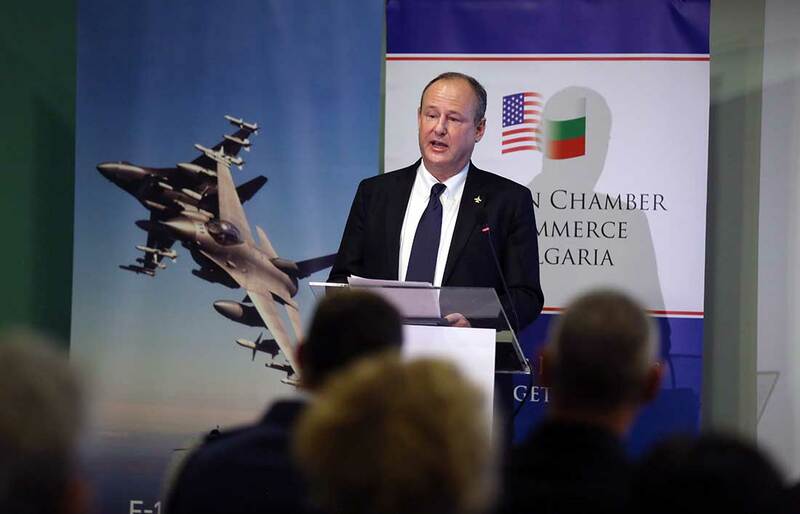 Ambassador to Bulgaria Eric Rubin and the International Business Development Director for the F-16 Program at Lockheed Martin James Robinson. Erik Rubin, who was asked later by journalists, shared that there is a chance that if Bulgaria chooses F-16, it to play an essential role in its maintenance for the region, and he added that the deal does not only include a purchase of equipment, but also trainings for the whole spectrum of military personnel, not only for the pilots. The proposed package will help the aircraft to be operated properly and longer. In turn, the Director for the F-16 Program at Lockheed Martin James Robinson hinted that it was difficult to be met the 24-month deadline set in the plan of the Bulgarian government for the delivery of the first batch of fighters. “We are worried about the delayed procedures, but I am optimistic and, as far as we know, we are working to meet the set timeframe. I cannot comment on the prices, at the moment, because it is a process of commercial talks” – Robinson added. Robinson presented a short video of the proposed aircraft, revealing that the new version of the F-16 Block 70/72 has different functional improvements that are close to those of the F22 and F-35. The F-16 is now certified to 12,000 flight hours, it activates Ground Collision Avoidance System and features the capability to track not one but several targets simultaneously. “The F-16 Block 70 represents the best combination of operational capabilities, avant-garde avionics and the lowest cost for the entire life cycle, involving the cost of the overall program for the Bulgarian Air Force. We are convinced that it is the fighter that will strengthen Bulgaria’s strategic partnership with NATO and the U.S. The F-16 Block 70 is fully interoperable with the NATO operational requirements and represents the backbone of the NATO Air Force.” – James Robinson pointed out. BulgarianMilitary.com recalls that over the last 25 years, the US government has invested over $ 300 million in training and equipment for the Bulgarian Armed Forces. The targeted assistance for the Bulgarian Air Force amounts to $ 50 million. Only, in the last three years, the U.S. has invested approximately $ 43 million in infrastructure improvements at Graf Ignatievo Air Base and at Novo Selo Training Area, and these funds are in addition to $ 50 million which the U.S. and Bulgaria jointly invested in the construction of the Novo Selo Training Area.